Welcome to my blog! My name is Eloisa, I am the creator of this blog, and of all the recipes and articles you can find in it, and I am delighted that you are here. I am originally from Rome (Italy), but now I live in Barcelona. I have two cats, Mandarina and Gandalf. I am a Blogger, but also a Chef and a Recipe Developer for differents brands; Although I have many different interests, cooking is one of the things that motivates me most. I am always in search of new and curious foods, which bring flavor and color to my kitchen, and I firmly believe that we are the ones we eat, so all my recipes are thought to be as healthy as possible. Thanks to my continuing research, in 2016 I discovered the Fast Metabolism Diet, by the American author Haylie Pomroy. This plan seemed so interesting that I decided to try it and since then I have never left it. 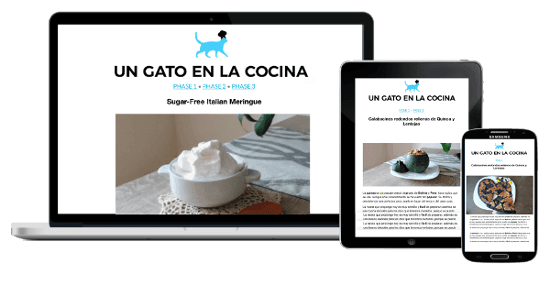 In the summer of 2016, I was finishing my studies of Community Manager and one of the tasks was to create a blog, that was how Cooking with a Cat was born. After a few weeks writing on the blog, I realized that I loved writing and sharing my recipes and that the blog was an incentive to be more and more creative. I love creating original recipes and for all types of people; In the blog, in fact, find dishes for all tastes, with meat, fish, vegetables, cereals … and if you are vegetarian, vegan, or celiac, do not worry, there are many recipes for you too. What I like most is that the blog is becoming a place to exchange experiences and opinions: FMD is a fantastic way but it is much better if it is done with other people. The FMD is a plan created by Haylie Pomroy, who, unlike other diets, wants to repair your metabolism. Although it is called the Fast Metabolism Diet, I do not see it as a diet, I see it as a healthy and varied lifestyle, a way to eat well without having to give up those dishes that for us are irresistible. If you want to discover more healthy and tasty recipes, sign up my newsletter, and follow me on Facebook and Instagram.